Even though I said I wasn't going to, I decided to join in at the very last minute If you haven't heard of the Pay it Forward Blog Hop, What planet have you been living on? So here's the deal, I get to pick three blogs and hopefully introduce you to a couple new writers that you haven't met before. I'm really sad that I only get to pick Three becasue I really Love so many of you! First up is Cherie at Ready.Write. Go. We have been blogging for about the same amount of time as her and I really love every single thing she posts on her blog. If your not following her, you're missing out BIG TIME. Next is David Powers King from The Cosmic Lair. I got to meet David at a writing conference and I am a huge fan. I really don't know anyone who isn't following him, but just in case you aren't here he is. Last, but not least, is Abby Fowers at Something to Write About. I got to meet her too at the same said conference and can I say instant BFF? She is beyond awesome you'll want to check her out. Ah Jennie - thank you! You have totally made my day. Instant BFF's? HECK YA! What a fun blog hop. I need to go check it out! I love the other two blogs you mentioned too! They are fabulous! I know everyone but Abby! Thanks for participating in our blogfest. Hi J.A. 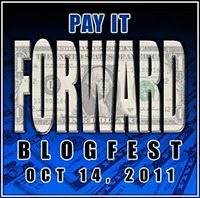 I'm here as the co-host from the Pay It Forward blogfest. Thanks so much for signing up. And I wasn't following your blog until just now, so the fest is working! I did not even know about this. That makes me from some other planet. They always said I moved my neck like E.T. when I was a kid. Now it all makes perfect sense! Hi, I am visiting from pay it forward. I love your blog. I am off to visit the blogs you have recommended. I have been living on the planet of Fiendish Editing. I'm gone for a month and look at you! Your followers have doubled, your hair has grown, (I love the new pic!) and you've got fans coming out of everywhere! I also love the new WIP, Existence! I so can't wait for that one! Where's your pages written thing so I can follow along. I hope Earth Song is coming along. I just am so out of touch but wanted to say hi and tell you that I think of you often. Hope all is going well. I'll be back soon. I love this blogfest. It was coming up when I was away, so I didn't write a post, but I've found a lot of great blogs as a result.